On the occasion of its 75th anniversary this year, No. 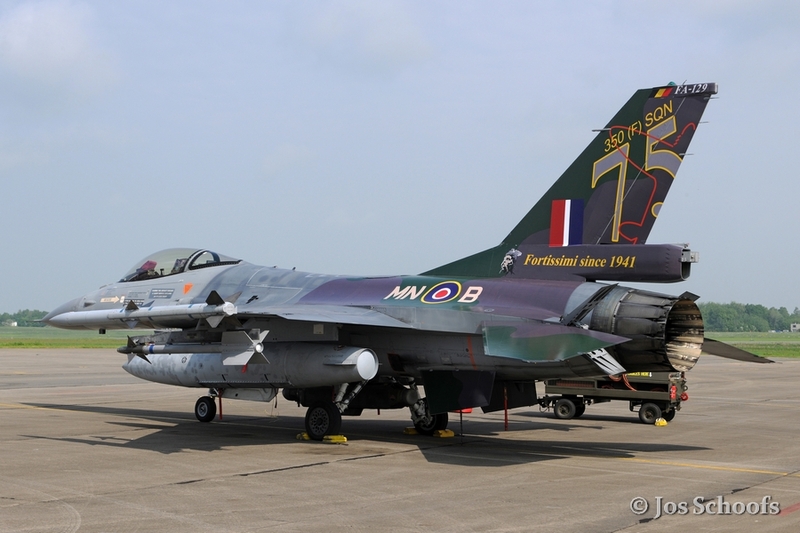 350 Squadron adorned the vertical tail fin of Lockheed Martin F-16AM FA‑129 with a 1940s era Spitfire camouflage scheme and squadron code MN-B. This code was carried by Spitfire LF.IXc MH434 when it served with No. 350 Squadron from January till March 1944. Belgian pilots flew the same aircraft a second time when it joined the Belgian Air Force’s Advanced Flying Training School at Brustem Air Base as a training aircraft carrying the serial number SM-41 in October 1953. Although the aircraft was withdrawn from military service in May 1954, it still is flying today in the air show circuit as MH434. The national insignia on the fin’s port side are post-May 1942 RAF national markings, while those on the starboard side are 1945-1948 style Belgian markings. The text “Fortissimi since 1941” is based on No. 350 Squadron’s motto “Belgae Gallorum fortissimi” as written by Julius Caesar in his “De Bello Gallico” on the Gallic Wars. The unit’s badge is formed by a Gallic warrior’s head. No. 350 (Belgian) Squadron was formed at Valley on 12 November 1941 from the Belgian flights of Nos. 131 and 609 Squadrons. 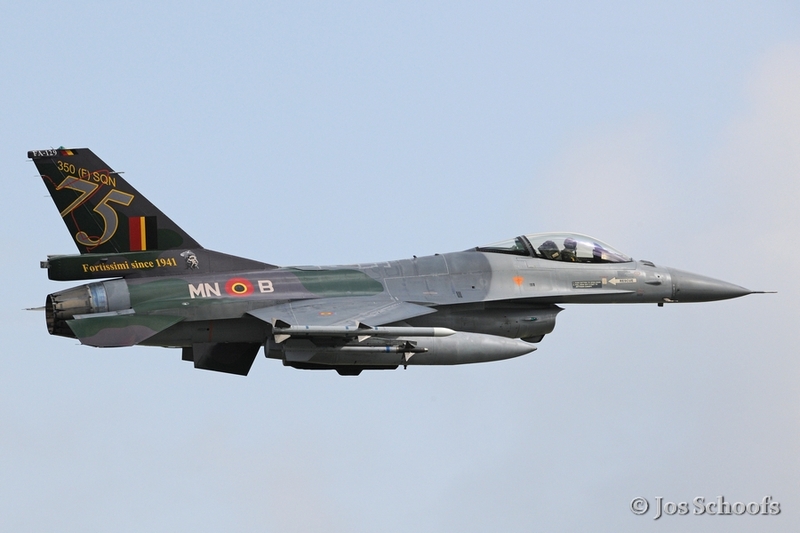 It was the first Belgian-manned fighter squadron in the Royal Air Force and became operational on Spitfire IIA on 22 December. In April 1942, the unit moved south to start combat operations over northern France. During the war, it participated in among others Operation “Jubilee”, the landing in Dieppe on 19 August 1942, and Operation “Overlord”, the landing in Normandy on 6 June 1944. Later on it was engaged in intercepting V1 flying bombs over England and in supporting the advancing Allied armies in Belgium, the Netherlands and Germany. After the war, No. 350 Squadron was part of the occupation forces in Germany until it was transferred to the control of the Belgian Air Force on 15 October 1946. During 50 years, No. 350 Squadron operated from Beauvechain Air Base. 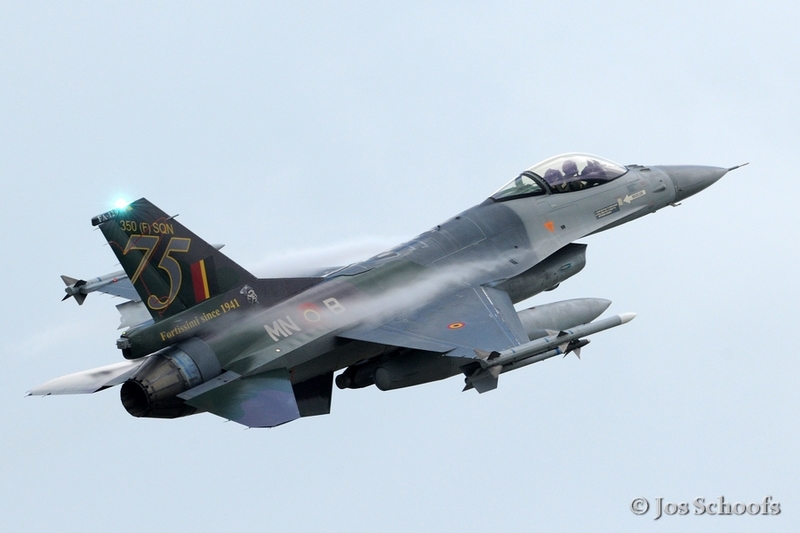 In 1996 it moved to its present home base, Florennes. It subsequently flew on Supermarine Spitfire XIV, Gloster Meteor F.4 and F.8, Hawker Hunter F.4, Avro Canada CF-100 Canuck Mk.5, Lockheed F-104G Starfighter and Lockheed Martin F-16AM Fighting Falcon. After half a century of Cold War training, No. 350 Squadron resumed participating in real operations from 1996 onwards: Operation “Decisive Endeavour” in Yugoslavia from October 1996 till June 1998, Operation “Deliberate Guard” in Yugoslavia from June 1998 till June 2001, Operation “Allied Force” in Bosnia and Kosovo from March till June 1999, Operation “Eastern Eagle” in Afghanistan from July 2005 till January 2006, Operation “Guardian Falcon” in Afghanistan from September 2008 till September 2014, Operation “Freedom Falcon” in Libya from March till October 2011 and Operation “Desert Falcon” in Iraq from October 2014 till June 2015.